Hello, all! Most of you probably know about my speculative fiction blog/webzine, SpecFicPick. I'm just doing a little cross promotion on my personal blog today to tell you that I've started up a Facebook group called SpecFicPick Community. Everyone is free to join this group; it's a place to talk about speculative fiction and post your book links and announcements. You can join here. Also be sure to like SpecFicPic's Facebook page while you're at it. You can follow SpecFicPick on Twitter as well. 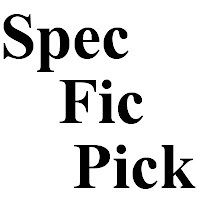 I'd also like to put out another call for articles and reviews for SpecFicPick. You can see the submission guidelines here. I've gotten a lot of requests for Book Features but would like to expand the scope of the website, so please keep SpecFicPick in mind if you have an idea for an article. Writing guest articles is a great way to expand your audience.